It goes without saying that being prepared helps prevent unneeded pain, delays and expense. 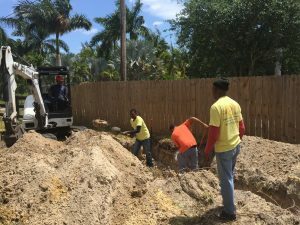 From prior first hand experience, I know that it is always good to call a Utility Location Service (*811) to make sure you know exactly where buried utilities are. 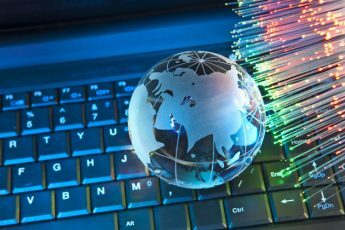 In South Florida, the it is a free service and makes very good sense. But, I have to say, even with knowing exactly where the buried utilities are, sometimes contractors get a little carried away and cause unnecessary damage. That is precisely what happened this past week. 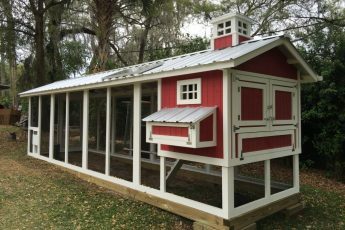 After months of planning, and getting the permit and contractors lined up to pull in electric service to the barn, we still managed to have a minor catastrophe. 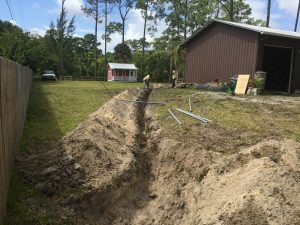 The electrical contractor I hired to install the 200 amp service to the barn was told exactly where our underground drainage was. A little history: The original drainage was installed about 8 years ago along the perimeter of the property. it is 5 feet below the surface and 500 feet long spanning from an exposed storm-drain to the canal. 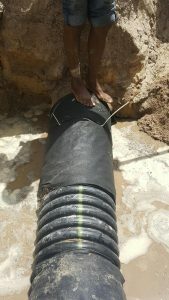 As this drainage is “private” – it does not belong to any Utility service and is my responsibility to maintain. It exists primarily because when the property was re-platted by the original owner, the county required proper drainage. It was subsequently installed with a substantial cost by the previous land owner. Fortunately for me, it works very well, and was completed a few years prior to me purchasing the property. To be honest, I didn’t get a locator service to come out to the property to do their thing. This was because I am very aware of exactly what is in the ground at this location. I knew that other then this drain pipe, there was no electric, cable, water or any other utilities at that location (YET!). Even so, I probably should have called 811 to err on the safe side. 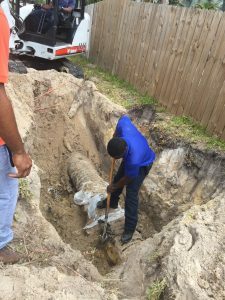 According to Florida code, a buried electric feeder line coming from the utility pole needs to be placed at least 30″ below the surface. This will be well above the existing buried drain pipe. I shared this information and showed my contractor exactly where the pipe was buried. He told me he would trench from the utility pole to the barn and be careful not to hit the drain pipe. He even told me he would dig the portion near the drain pipe by hand so not to cause any unexpected surprises. So, with that knowledge, I headed off to work and let the contractors loose on the property. About 2 hours later, I got a call from my electrician. 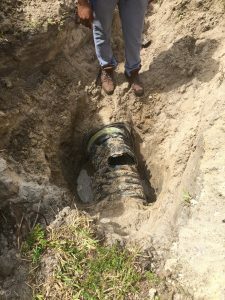 He said “I have good news and bad news.” He continued to say that the trench was completely dug, but his guy “got carried away with the Bobcat” and hooked the 12″ drain pipe with the bucket tearing a hole on the top of it. He said he would repair it and would eat the cost. Yes, this was a minor issue, but it cost him over $500.00 in parts and labor. He had to call a friend who was a licensed plumber and qualified to come out and make the repair. The replacement section was about 5 feet in length, but the pipe only comes in 20 foot sections and was $350.00 just for the pipe. He needed very special connectors to join it all back together. With 4 guys, a plumber, and new parts, this set them back 4 hours. Time which should have been spent rewiring the barn as initially planned. 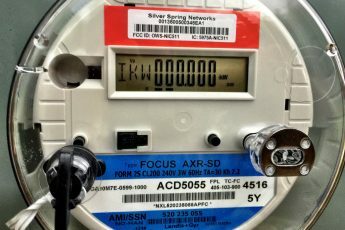 Fortunately, as Florida Power & Light was scheduled to arrive at 8:00 am the next morning to install the riser on the utility pole and pull the wire from the pole to the meter can, they were able to make the repairs and complete the installation before sunset. Lesson Learned? Absolutely – Even with great planning, sometimes you need to pay more attention to the contractors. Additionally, if you are not 100% sure of what is in the ground, get a locator service to identify exactly where all utilities reside. Could this have been prevented? Of course.